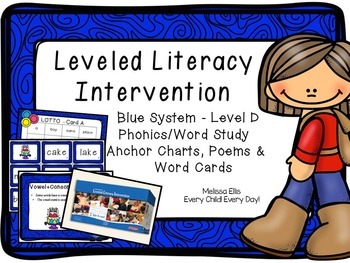 This packet was designed to coordinate with the Fountas and Pinnell Leveled Literacy Intervention (LLI): Blue System Level D = DRA 6 = 1st Grade. The cards, poems and anchor charts can easily be used independent of the program. Perfect for Intervention, Special Education or Small Group Instruction. I currently use LLI with first - fifth grade in reading intervention groups.I decided to make my own anchor charts, poem pages and word cards to accompany the program. The lesson number is included on the bottom right hand corner of each chart, poem and card. This helps me keep my materials organized! 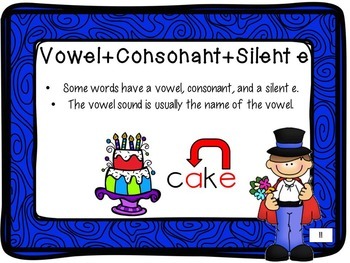 I use the anchor charts to help explain the phonics/word study portion of the lesson. It also serves as my "I can" statement for my lesson. I laminate the word cards, headers and charts. 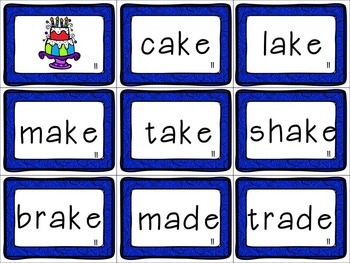 The students sort the cards in pocket charts, use wipe-off markers to manipulate the words and play word games with the cards. I store the cards and anchor charts in a three ring binder. The anchor charts are placed in plastic page protectors. I store the cards in baseball card protectors. This keeps my materials organized and easy to access. I also retyped the poems needed in the lesson. A color and black and white version is available for each poem. A blank poem is also included for students to illustrate. The packet contains anchor charts, poems and word cards for lessons 11-20.